About five years ago, I asked a girl I met online if she wanted to go get drinks some time. Seemingly interested, she said sure and asked what kind of beer I like. I responded honestly that I liked cheap beer, or to be more specific, I said, “whatever gets me drunk in a pinch.” She never talked to me again. While I’ve matured a lot since then, I’d be lying if I said I was any kind of beer expert. I couldn’t even begin to explain the difference between hops and malts or tell you what IPA stands for without googling it. Furthermore, even if I wanted to venture out of the realm of Lone Star and PBR, my acid reflux made it a little difficult to do so without feeling unnerving pain in my chest. That said, I felt a little inexperienced to write about a music festival that revolved around beer and different brewers. Fortunately, Untapped Festival offered up a great lineup of musicians that made it easy for a beer philistine, like me, to enjoy. While Untapped Festival has been going strong for a few years now, this was the first year the festival rolled through the Alamo City on November 21. 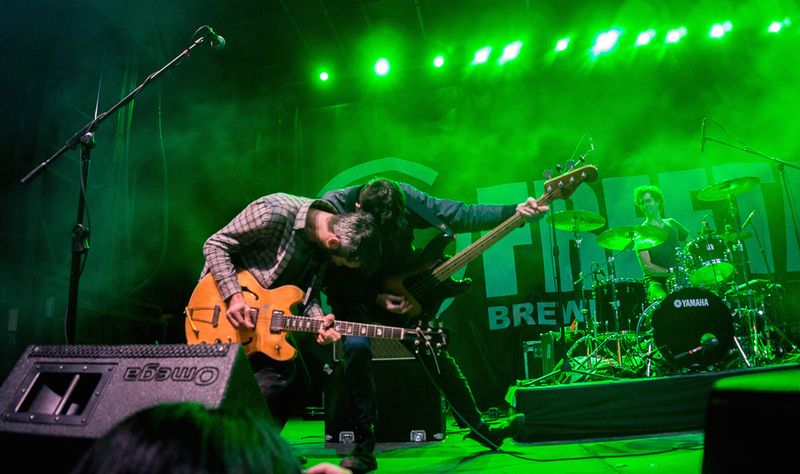 With a stacked, eclectic lineup and a very affordable admission price, Untapped San Antonio drew a strong crowd of beer nerds and music fans alike. The weather was blistery and only got colder as the night progressed, but fortunately stayed dry and wasn’t too much of a distraction from having a good time. I arrived in the afternoon in an American Apparel hoodie, thin and more of an accessory of aesthetic than something you would wear to keep yourself warm. I thought being emerged in the crowd and under the influence of the finest craft beer in the city would keep me toasty, but I didn’t anticipate the weather delving into the low 50s. Fidgeting to stay warm, I reach the media area and see fellow Creative Socialite photographer, Wayne, in a leotard and fur coat looking like R. Kelly about to go to a midnight showing of Rocky Horror Picture Show. I immediately warm up because Wayne has that effect on people. We are handed a sample cup and a checkbox for samples of beer. I like to think that I decided to go into this with an open mind and, acid reflux be damned, try as many different beers as I can so I can fully emerge myself into the experience. In reality, I just wanted to get a good buzz for free. We headed over to the Fireman’s 4 tent and handed them my sample cup, I felt like Brodie from Mallrats. When they asked me what I wanted, I panicked. The vendor sensed this right away, smiled and said, “here try this.” It was called Benedictum and tasted vinegary but at the same time had a whiskey sensation to it. I loved it and hated it at the same time, but finished it wondering if I could enjoy a whole glass of it. My attention turned to an old classmate I hadn’t seen in years working the Southerleigh tent. A brewer, himself, he recommend I try their Orange Cream Angel. I am not disappointed. It tastes like sherbet and was a sweet contrast to the bitter Benedictum. Feeling a bit of the beer tasting bug, I headed over to the Samuel Adams tent where I pointed the Rebel Grapefruit Ale. I figured: I like grapefruit vodka, I would probably like grapefruit beer. While not as sweet, it was still pretty enjoyable and I could easily see myself ordering it at a bar to sound like somebody who doesn’t usually ask “what’s your cheapest beer?” I bottom up the sample cup and look around for the next beer I want to try. Woodchuck’s tent stares out to me and I decide that we should try a cider. They pour a Woodchuck Hopsation into my cup and I pour it down my throat like it’s some kind of antidote. I perk up and I think I’m drunk. I realized I’ve had several samples in the last 10 minutes. All I can hear is trumpets in my head and they’re playing Uptown Funk by Marc Ronson, only not really. I look around wondering if somebody has a radio with a bad signal but nothing. Now the sound is more apparent, only it sounds like mariachis. 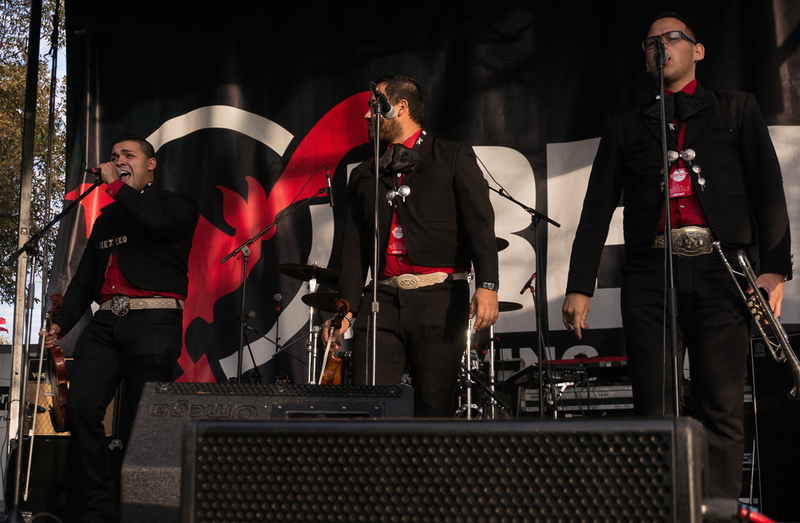 I look to the stage and realize Mariachi Nuevo Estilo is playing their set and are covering the top 40 jam. I’m not drunk, I’ve just heard that song so many times it makes me feel drunk now. The band transitioned through different covers including a Sam Smith song and showed off their vocal skills with a cover of Selena’s Como La Flor. They proclaim that they’re not like other mariachi bands and provide a good transition to the main bill for the rest of the show. I wander from the stage to get a Boulevard wheat beer and it’s enough to wake up my acid reflux to remind me that if I drink anymore, there’s a good possibility my heart is burning a hole in my chest. So I retire my liver from the beer part of the festival to focus on the music. Girl in a Coma is one of most, if not the most, popular bands to come out of San Antonio in the last decade. 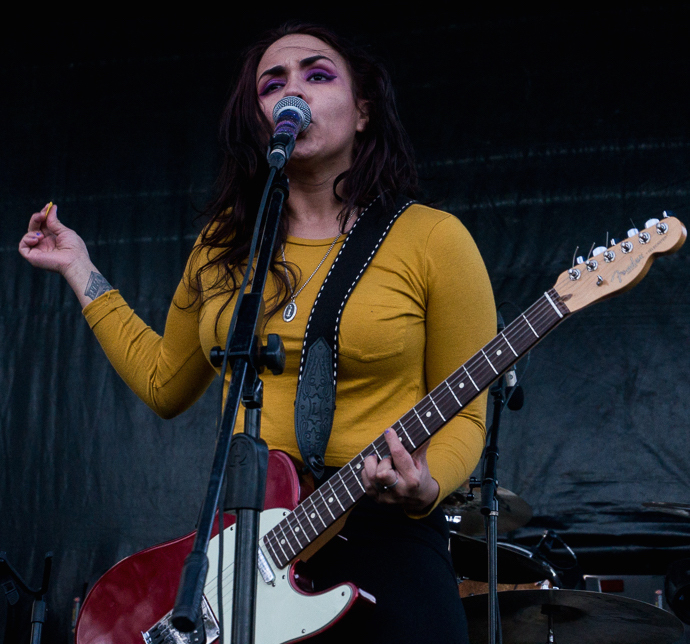 Lead singer Nina Diaz’ eponymous side project took the stage while the sun began to dim taking what little warmth with it. That didn’t seem to matter too much as Nina radiated on stage vibing along to each song with a burst of energy that warmed up the crowd. There is a sense of pride watching a San Antonio native command a stage like that, especially coming off multiple projects getting national attention. She takes the stage like a pop star but jams with punk rock ferocity for an overall engaging performance. Even though she’s a veteran of the music business, it’s going to be exciting to see her breakthrough further in the next few years. 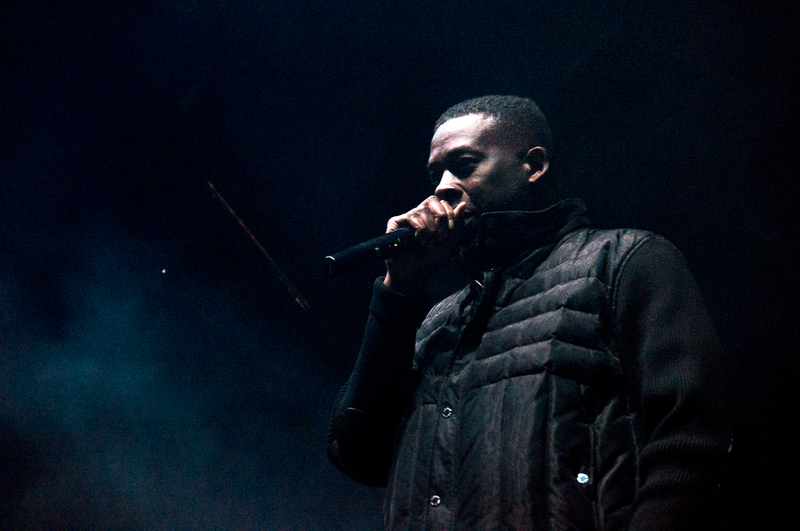 Having seen GZA perform with Wu Tang at Fun Fun Fun Fest, I was interested to see him take the stage solo. My favorite thing about Wu Tang is that they are more than just a hip hop collective. They have crafted a mythology around the 36 Chambers that is as expansive as the Game of Thrones universe. While, in the ‘90s, Puffy and Biggie were seen as entrepreneurs of the rap game, Wu Tang spread across multiple platforms not only changing the rap game, but creating an entity that has strived and prospered over the past two decades. 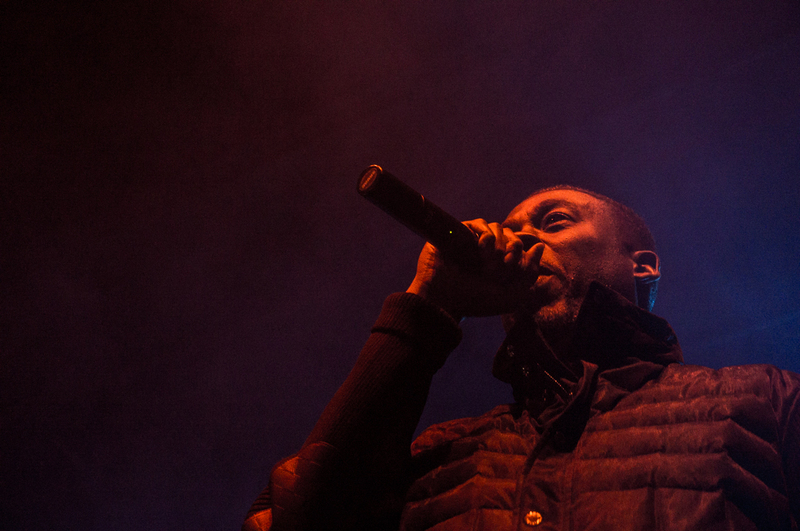 GZA is at the reigns of Wu Tang culture; he is the brain, the mastermind, the architect. At the same time, he comes across as the least outspoken. He’s not as ubiquitous as RZA, nor is he as controversial as ODB, but he is still an omnipresent force amongst everything Wu Tang related. He is essentially both the Tim Duncan AND Gregg Poppovich of Wu Tang: without GZA there is no Wu Tang Clan. GZA came to the stage fashionably late; not late enough to irritate the crowd, but just the right amount of time for the crowd to get hyped up to see one of the most revered names in hip hop. He came out solo, backed up only by his DJ and his presence alone was enough to send chills. Wayne would later admit to me that he had no idea who he was when he walked out, but immediately felt his presence like he was somebody important and/of legendary status. GZA put on a modest set, thumping through his discography and some other Wu Tang member cuts including a run through of ODB’s signature Shimmy Shimmy Ya. The crowd responded endearingly and thumped along from start to finish. When all was said and done, he retreated to the backstage, fulfilling a high fidelity set that was satisfying in all of its nonchalance. The temperature had dropped several degrees over the course of GZA’s set and I am completely regretting suffering for fashion wearing this thin hoodie just because it matched my hat. 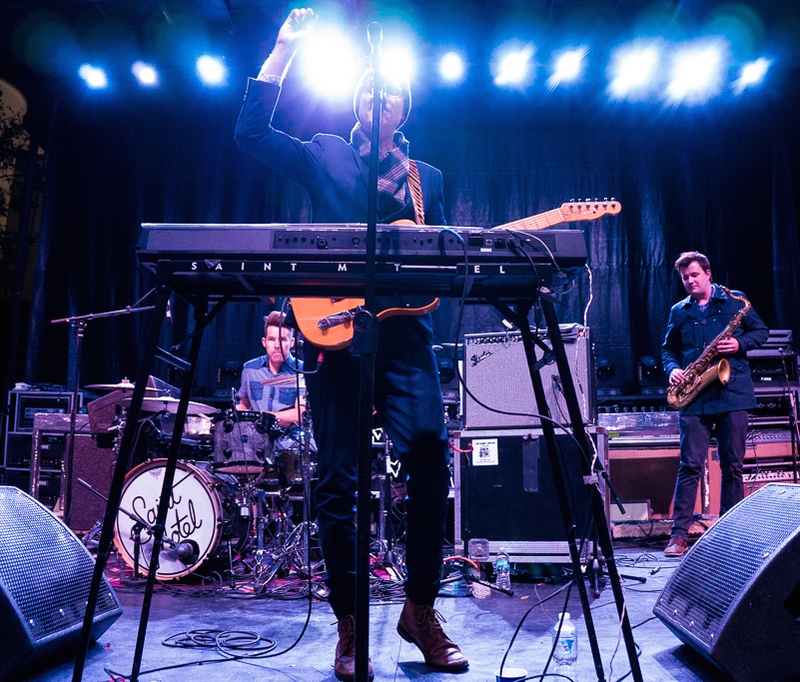 We shiver over to see Saint Motel who took the stage adorned in scarves and winter wear. They come out with youthful gusto and immediately dive into their set. This was the band I was least familiar with as far as the main lineup is concerned. They come off as a kind of collective that plays festivals celebrating diversity as their sound transcends several genres. Their songs could easily be mistaken for something Marc Ronson would write for a mega pop stars, but there’s a more raw edge to their sound that feels more nature. Saint Motel feels like the type of band that consists of talented studio musicians who got together to write their own music. Every member feels like they have mastered their instrument and brings something different to the band. They write catchy music with tons of hooks and toe tapping rhythms. They made it very easy to get submerged into their sound and dance to songs you’ve never heard. We left a little early to head over to the stage for Tokyo Police Club, to allow Wayne the proper time to fanboy out. For anybody who doesn’t know Wayne (all six of you in the city of San Antonio), he is the epitome of a socialite. You can’t go anywhere with him without running into tons of people he knows and this day was no different. One particular encounter occurred while we waited for Tokyo Police Club to take stage. Wayne was going on to a friend about how much he loved the band and how excited he was to finally see them live. Unfortunately, his friend had never heard them and asked us what they sounded like. This would normally be an easy question to answer, especially when talking about a band you’re into, however Tokyo Police Club is tough band to narrow down. 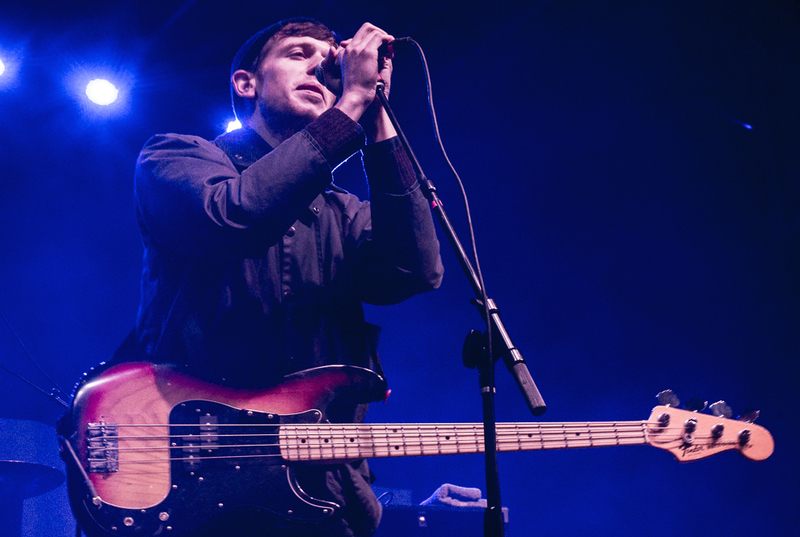 We could have said that Tokyo Police Club is an indie rock band, but that opens up an ambiguous can of worms that only leads to more questions. No one means independent when they say indie anymore and instead it’s treated to an airy, softer sound that doesn’t correspond to the band. We could have said they’re an alternative band, but that doesn’t really capture the essence of what Tokyo Police Club is about. Alternative is reminiscent of the better half of ‘90s rock with more aggressive undertones that make up what has been affectionately referred to as “dad rock.” The band sets camp on a DMZ of alternative rock and indie rock and really captures the best of both worlds. Another band that has compromised this same Venn Diagram is The Strokes, but to say Tokyo Police Club sounds like The Strokes still doesn’t accurately capture their essence. So, after a few minutes of debate, I blurt out to Wayne’s friend that Tokyo Police Club sounds like The Strokes… if they were picked on in high school. Within seconds of coming on stage, the band essentially confirms my description with their brand of rock and roll with a soft demeanor that still isn’t afraid to jam. The band comes across as very boy next door, they’re very polite and charmingly nerdy. They piece their set through their nearly decade-long discography and every song sounds different but still manages to stay within their aesthetic. 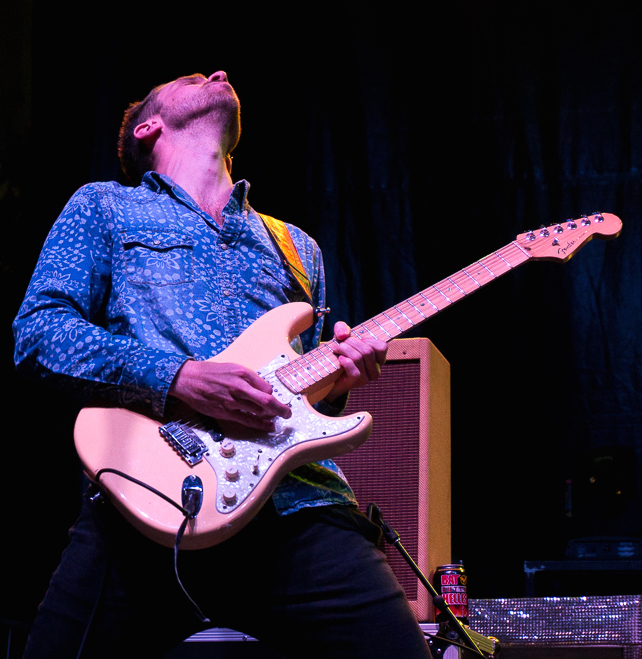 There isn’t a lot of shredding or crazy drum fills, they just stay steady with a nice clean rock and roll sound. The quartet moved up and down the stage, swaying to the beat and ultimately just looking like they were having a good time. Their good vibes must have warmed the crowd because as I left to set up a spot for Metric, I realized how cold the night had become. The chills ran down my spine and my fingers felt numb. I waited patiently as Metric finished setting up. Despite being immensely organized, Untapped had one band setting up on one stage while the other performed on the other, I was still quaking awaiting the band. I pull out my phone to tweet what I said about Tokyo Police Club, so I could remember to add it to this write up. One of the security guards looked over and asked me “Can you even feel your fingers, man?” I look up and tell him “just barely, they’re numb as Hell.” We waxed intellectual a little bit to try and forget about the cold; he ribbed me for wearing a Texas Rangers hat instead of a Houston Astros hat, he said he’s the bassist of a band from Houston called Jack Tripper or maybe it was Jack the Tripper. He spent as much time trying to describe their sound as I did trying to describe what Tokyo Police Club sounds like and I determined that this dude was cool. Wayne popped up and the security guard stared in shock. “This dude is crazy,” he said to me laughing. “ I’m here complaining about the cold while wearing a long sleeve shirt and jacket and this dude comes up, pretty much in lingerie, not even shaking.” His thought is interrupted by the PA system going silent for a second before a voiceover that sounds like it could be a B-side to Carl Sagan’s Cosmos reverberates through. 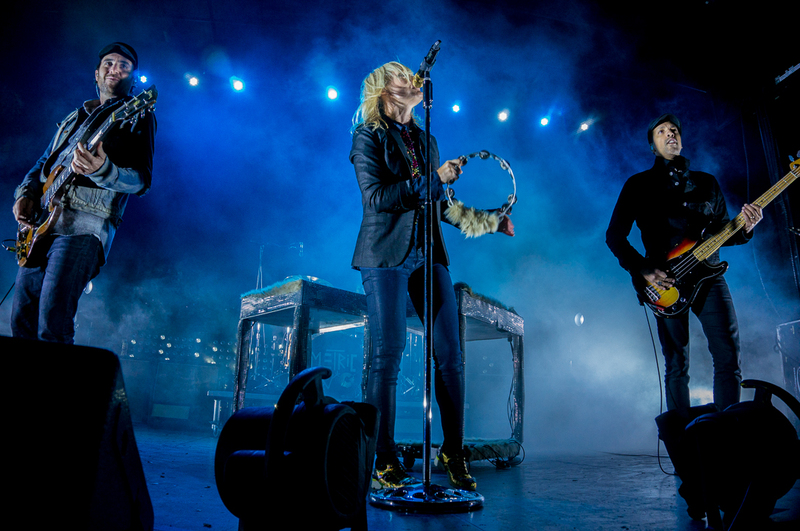 Metric comes out one by one wearing masks of animals and carrying flashlights to shift through the dark stage and dry ice. They stand side by side as the voice over finishes, damask and retreat to their instruments. 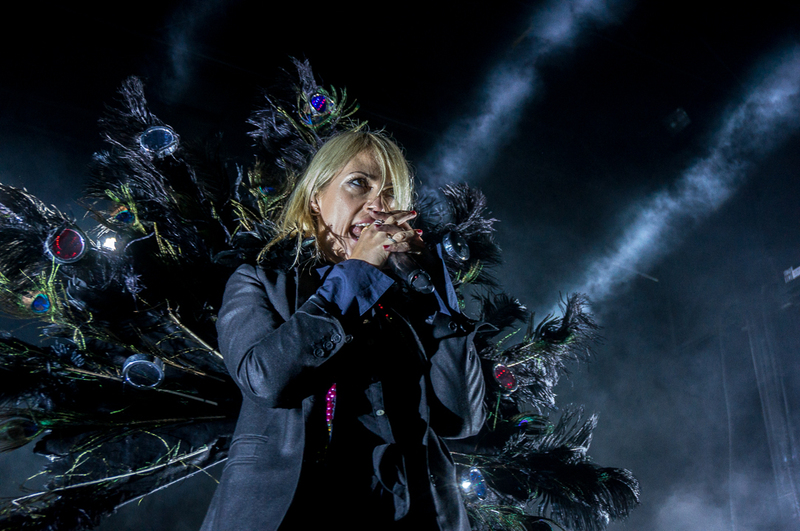 Lead singer Emily Haines comes out with giant peacock wings adorned to her back. It’s a kitschy introduction that sets the stage for a powerful set. 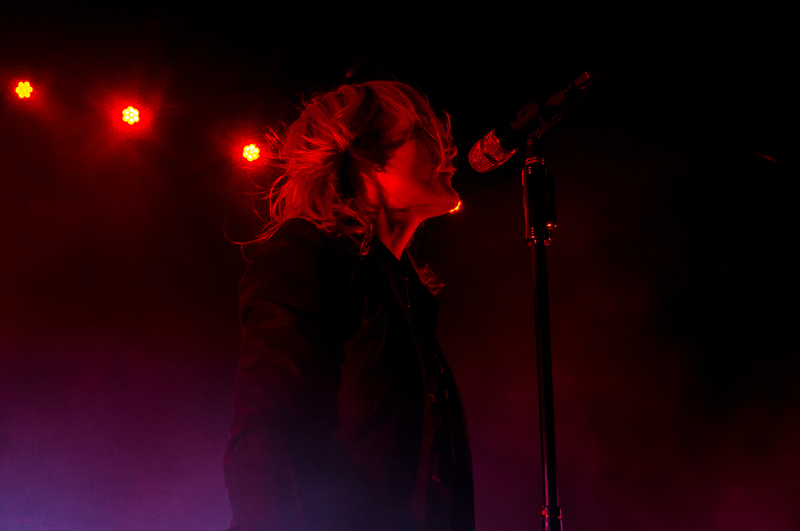 Metric plays with the bravado of an arena rock band with an amazing light show and a larger than life presence that emits their music through a prism of dance rock aggression. 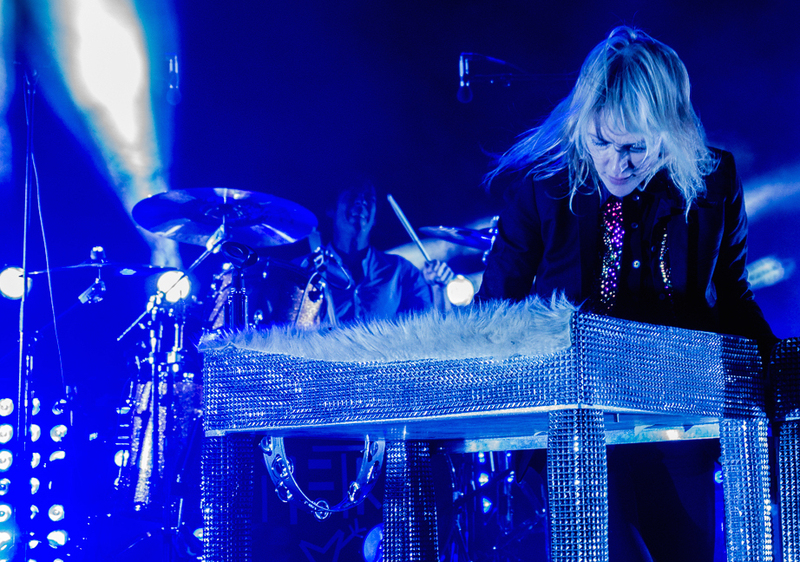 Threading the line on a rock and roll band with dancey beats and a dance band with rock and roll guitar riffs, Metric doesn’t disappoint. They sashay to and fro and turn the stage into a dance floor. 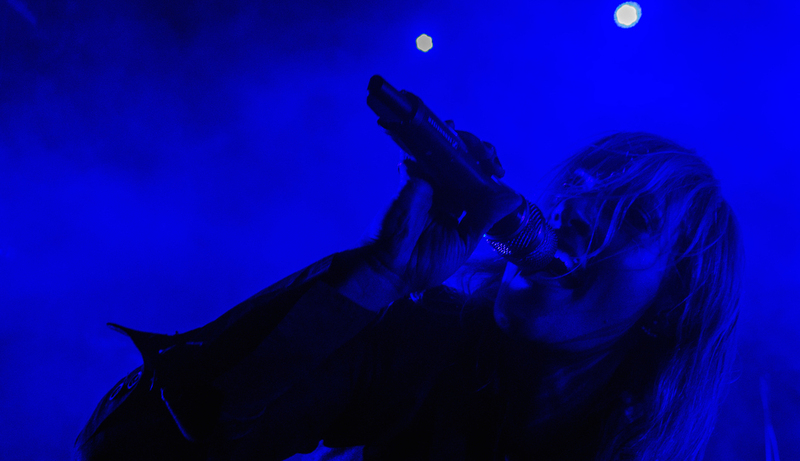 Their energy radiates throughout the crowd raising the temperature several degrees. The light show was extravagant and complimented every aspect of every song. When they played “Black Sheep,” the song they contributed to the stellar Scott Pilgrim soundtrack, they echoed the sentiment of the movie with flashing colors that felt like you were in the panels of a comic book about a rock and roll band. During songs, they are the epitome of rock stars tearing through like their entire mission in life is to rock our faces off. In between songs, they come off much more magnanimous and so sincere, it just made you like them more. There wasn’t a single lull from start to finish and they played to a packed crowd that sang along and danced the night away. It was the perfect way to end the festival and Untapped knew exactly what they were doing when making Metric the closing act. 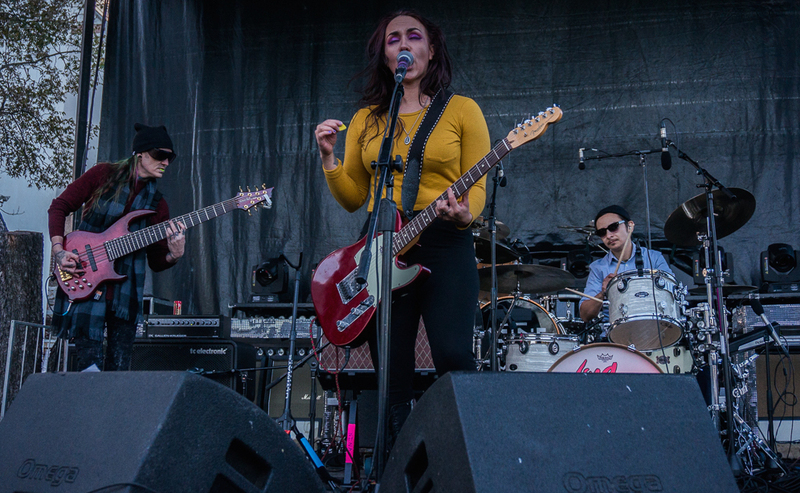 It was a successful debut for the festival in the Alamo City and one that, despite the cold, will be difficult to beat next year. The best thing about the festival is that it didn’t feel exclusive. You don’t have to know anything about beer to have a good time. I had beer noob written all over my face, but not once did anybody make me feel bad about it. All the vendors were more than helpful and eager for me to try something new. The music was just the cherry on top. Untapped states that their goal is to integrate what makes beer festivals great with what makes music festivals great. They achieved this and then some. As San Antonio continues to culturally expand, Untapped Festival’s premiere is a sign of even greater things to come. For more pictures, check out Wayne’s gallery here.